It was another hot night at Busch Stadium Thursday, with the game time temperature again above 100 degrees. 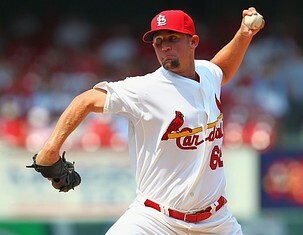 The play of the St. Louis Cardinals remained hot too — there was much good in the 6-2 victory over the Colorado Rockies. And that included the pitching of Barret Browning. The continued perfect pitching of Barret Browning. Now, granted, four perfect innings to start your major league career isn’t necessarily enough to get hugely excited over. If Browning was a starting pitcher, we might be thinking “Hmmmm, this is interesting” as he finished the fourth inning by retiring 12 consecutive batters. As you take the pitcher’s mound each day. So the winner of each battle is you. Two pitches, one out, to start your part of the game. Because he still threw to first for the out. Out number three was via a five-pitch K.
We know that the big leagues is your place to stay. But we admire the perfection so far, and of course you. Lance Lynn. The first two innings were a bit rough, but then our All-Star Wolf Pup settled down and retired 10 straight batters. He held the Rockies scoreless in his six innings, giving up four hits and striking out seven. He finally earned win No. 11. Matt Holliday. He now has a streak of six consecutive games with an RBI, as he drove in the Cards first run last night plus another with a bases-loaded single. He’s now 34 for 68 with four homers and 21 RBI in his last 18 games, according to the Associated Press. Carlos Beltran. The All-Star continued to show why he’s going to Kansas City, as he had two hits and drove in two runs — he followed Holliday’s bases-loaded single (which kept the bases loaded) with a two-run double in the Cardinals five-run fifth inning. Matt Carpenter. In a very La Russian move, Mike Matheny’s starting lineup featured Matty Carp at second base — a position he last played when he was 13 — as a way to keep his bat in the lineup. And he responded by singling in his first at-bat, plus was walked and scored a run in the fifth. And he did adequately at second for the six innings he was in the game. The victory meant the Cardinals took three of four from the Rockies and are five games over .500 at 44-39. They remain in third place in the NL Central, but just 2 1/2 back of the Pirates — and only half a game behind the Reds in second. Headed to town for the weekend are the Miami Marlins, with only three games left before the All-Star break. And, in case you somehow missed it yesterday, the Cardinals do have five All-Stars now — David Freese was the fan’s selection during the Final Vote. Thank you from Barrets Family back in Jesup Ga.I emailed this to his parents and wife who have been in St Louis since friday.He has worked so hard for this chance.The poem is beautiful.